A violent Occupy Oakland protest over the weekend resulted in damage to Oakland's historic City Hall and YMCA and about 400 arrests. KNTV reports. Crews cleaned up Oakland's historic City Hall on Sunday from damage inflicted overnight during violent anti-Wall Street protests that resulted in about 400 arrests, marking one of the largest mass arrests since nationwide protests began last year. At a press conference on Sunday, Oakland police and city officials said they did not have a final tally of arrests. Earlier in the day, the city's emergency operations office put the figure at around 400. The skirmishes injured three officers and at least one demonstrator. Police said a group of protesters burned an American flag in front of City Hall, then entered the building and destroyed a vending machine, light fixtures and a historic scale model of the edifice. The city's 911 emergency system was overwhelmed during the disturbances. "While City Hall sustained damage, we anticipate that all city offices will be open for regular business tomorrow," said Deanna Santana, Oakland city administrator. 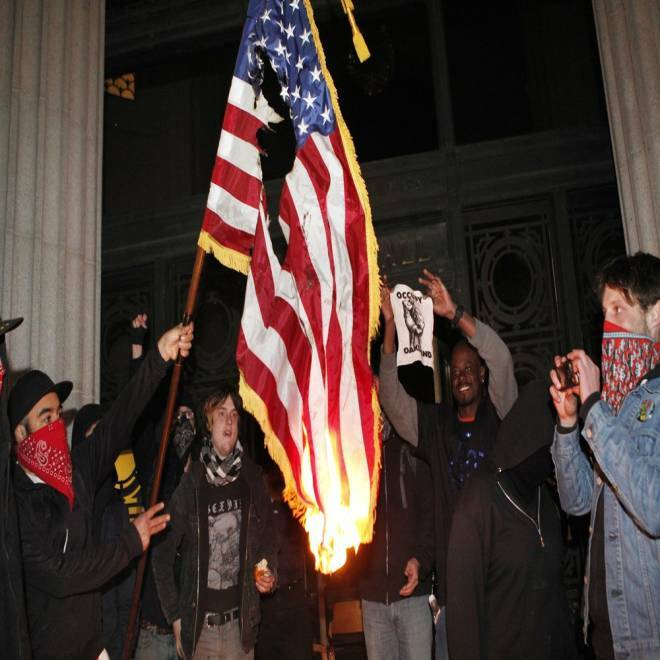 Occupy Oakland protesters burn an American flag found inside Oakland City Hall on Saturday. Oakland has become an unlikely flashpoint for the national "Occupy" protests against economic inequality that began last year in New York's financial district and spread to dozens of cities. The protests in most cities have been peaceful and sparked a national debate over how much of the country's wealth is held by the richest 1 percent of the population. President Barack Obama has sought to capitalize on the attention by calling for higher taxes on the richest Americans. Occupy protests focused on Oakland after a former Marine and Iraq war veteran, Scott Olsen, was critically injured during a demonstration in October. Protesters said he was hit in the head by a tear gas canister but authorities have never said exactly how he was hurt. The Occupy movement appeared to lose momentum late last year as police cleared protest camps in several cities. Violence erupted again in Oakland on Saturday afternoon when protesters attempted to take over the apparently empty downtown convention center to establish a new headquarters and draw attention to the problem of homelessness. Police in riot gear moved in to drive back the crowd, which they estimated at about 500 protesters. "Officers were pelted with bottles, metal pipe, rocks, spray cans, improvised explosive devices and burning flares," the Oakland Police Department said in a statement. 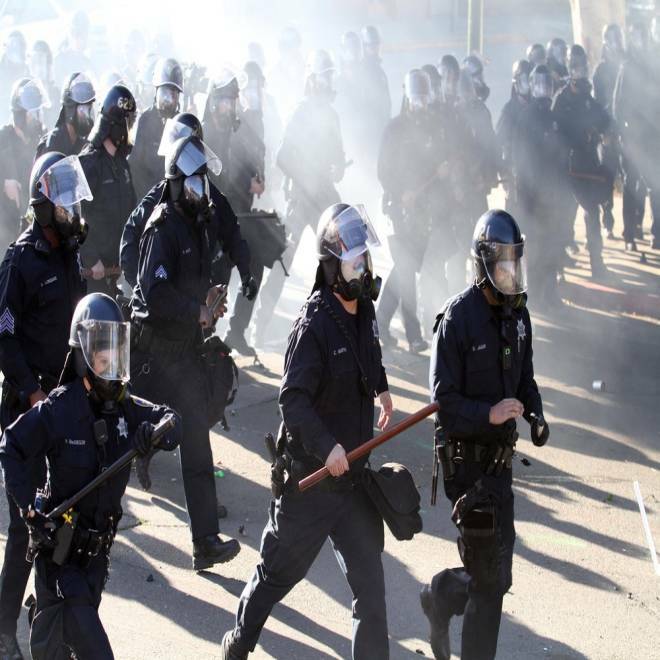 "The Oakland Police Department deployed smoke, tear gas and beanbag projectiles in response to this activity." Oakland Mayor Jean Quan accused a "violent splinter group" of the Occupy movement of fomenting the Saturday protests and using the city as its playground. Protesters have accused the city of overreacting and using heavy-handed tactics. Police move in on Occupy Oakland protesters on Oak Street and 12th as tear gas gets blown back on them in Oakland. Oakland officials on Sunday were inspecting damage inside City Hall that was caused by about 50 Occupy protesters who broke in and smashed glass display cases, spray-painted graffiti, and burned the U.S. and California flags. The break-in on Saturday was the culmination of a day of clashes between protesters and police. At least 300 people were arrested on charges ranging from vandalism and failure to disperse. At least three officers and one protester were injured. Quan said Occupy protesters have caused an estimated $2 million in damages from vandalism since October. She said the cost to the city related to the Occupy Oakland protests is pegged at about $5 million. This article includes reporting from NBCBayArea.com, The Associated Press and msnbc.com's Miranda Leitsinger.